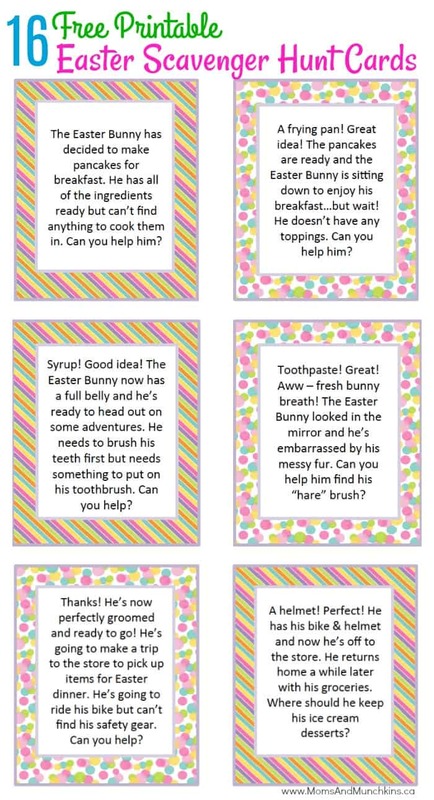 Here are some fun Easter Scavenger Hunt ideas for your kids to play that will lead them through a story of the Easter Bunny getting ready to leave for his Easter adventures. Each free printable clue will lead them to the next clue until they reach the final surprise. This surprise could be new personalized Easter baskets, an Easter craft, a small outdoor toy to play with or something else with a spring theme. You could use this free printable game as your main Easter egg hunt with eggs hidden along the way as they search for each new clue. To start with, you’ll need the free printable Easter Scavenger Hunt clue cards. Just cut out the clues, place them in plastic eggs, and hide them in the other clue locations around the house. You can leave the first clue somewhere for your child to stumble across in the morning. The Easter Bunny has decided to make pancakes for breakfast. He has all of the ingredients ready but can’t find anything to cook them in. Can you help him? So this first clue card could be hidden in a place that your child would see it in the morning – like on the kitchen table. So this clue is telling the kids to look for something that the Easter bunny could cook pancakes in – like a frying pan. So the next clue could be hidden inside a plastic egg in a frying pan in the kitchen cupboard. A frying pan! Great idea! The pancakes are ready and the Easter Bunny is sitting down to enjoy his breakfast…but wait! He doesn’t have any toppings. Can you help him? So this clue is directing children to the fridge where they’ll look for a bottle of syrup. The next clue could either be taped to the syrup bottle or in a plastic egg beside the syrup bottle in the fridge. Following along so far? Great! Follow the rest of the clue cards the same way – hiding them throughout the house for your children to solve and find. The last two “clue” cards aren’t clues at all – they are “Exercise Break” cards that you can hide anywhere along the way. So for example, you could hide this Exercise Break card in a plastic egg in the hallway for the kids to see as they’re racing to their next clue location. You’ll see what I mean on the free printable clue cards. Looking for the original Easter Scavenger Hunt printable? Click here for the older version. Visit our Easter Fun page for even more fun ideas like Easter treasure hunt printables, Easter recipes, party ideas, treat printables and more! We’re always adding new ideas and we don’t want you to miss out on any of them! You can follow us on Pinterest, Twitter and Facebook for the latest ideas for family fun. I’m always open to suggestions as well so don’t be too shy to ask me for specific activity ideas. I love requests from readers! Love this idea! We do a scavenger every year for Valentine’s Day but something about the clues scattered in colorful little eggs makes it so much more fun! This is SUCH a great idea. Kids still have the thrill of the hunt without all that sugar and petroleum-based food dye! I’m pinning this for next year! Thanks for sharing at the After School Linky Party! I am pinning this! What a great idea! I hope you had a lovely Easter. Great Idea! We love Scanvenger Hunts especially at Easter. First time monthly Newsletter arrived. Delighted. Cant wait until next month. Happy Easter.